The WelcomePickups Madrid airport transfer services can meet the needs of both small and large groups of travellers. Both a sedan car and a minivan vehicle are available as options. For up to 4 passengers, a comfortable sedan vehicle will be sufficient for your transfer from the airport to Madrid city centre or any other destination. In the event that you are travelling with a large group of people (up to 8), a minivan can easily handle your ride in the most convenient way. Adolfo Suárez Madrid–Barajas Airport, commonly known as Madrid–Barajas Airport, is the main international airport serving Madrid and nearby towns in Spain. Once you arrive at Madrid Barajas airport (MAD) your private taxi driver will greet you at the assigned Meeting Point, and carrying a sign with your name on it. The driver tracks flight arrivals and delays using a special mobile app, so you will always be greeted at right terminal at the right time. While travelling from the airport to Madrid city center or any other destination, the driver will give you tips and suggestions on what to do in the course of your stay. All drivers are carefully selected, have local knowledge and speak English. Everything is arranged so that you can enjoy the relaxed and comfortable trip from Madrid airport to central Madrid or your hotel. However, if you wish, your Madrid airport taxi transfer is just the start. You can also book in advance your “Skip-the-line” tickets for the best known attractions of Madrid, such as the Prado Museum and the Royal Palace. Your tickets will be given to you by your driver in order to avoid the big line ups at the ticket counters. This was our first time using Welcome Pickups. We had an early flight departure out of Madrid and wanted to ensure that we were picked up in time for our flight.Booking was easy and we had immediate confimation emails which communicated the pickup time, itinerary and driver with photo.Our driver, Juan, texted us to let us know when he arrived 10 minutes early. Juan was pleasant, courteous and informative – even at 4:30 in the morning! I would recommend using Welcome Pickups again! Booked this service for a Madrid/airport trip. Prompt email follow-up to our online booking and several subsequent emails with driver nomination/ booking reminder had us reassured. The airline had advised we shud expect airport delays for checkin and terminal transit, so pleased when our driver arrived 5 mins early. We didn’t really need that little extra time, but it removed any concern about timing. Professional, prompt service and competitive price is really what we wanted, and certainly received. Made for a contrast with late, out of place pickup at Heathrow later the same day. Get your low-cost transfer price quote now and enjoy your trip to Madrid! 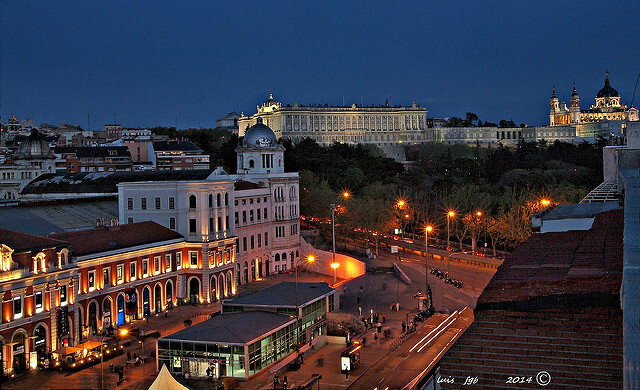 Photo of Madrid, courtesy of Luis Feliciano, Flickr.